--- If you cancel your reservation with less than 7 days notice, your deposit will not be refunded. We will try to re-book the room, however we will charge your credit card for all nights that we are not able to sell. --- If you cancel your reservation within 48 hours, your credit card will be charged the full amount of the reservation. --- For your protection, we strongly advise you to purchase travel insurance. --- If you cancel your reservation with less than 72 hours notice, your deposit will not be refunded. We will try to re-book the room, however we will charge your credit card for all nights that we are not able to sell. --- If you cancel your reservation within 24 hours, your credit card will be charged the full amount of the reservation. -- Double Occupancy: All bookings are based on double occupancy. Fees apply for additional guests, subject to the maximum occupancy per room. -- Pets: County Buzzz is a service animal and pet friendly property (owners have 2 cats), however there is a limit of one animal per room booked, and animals must be kept on a leash at all times. Guests must clean up after their pets (poop & scoop). Cleaning fees apply to any and all situations which require additional housekeeping services. -- Last minute reservations: For your convenience we offer secure on-line reservation. For “last minute” reservations, please call us at 647-233-5123. -- We accept cash, e-transfer, Debit, VISA, Master Card and American Express. -- All charges are in Canadian Dollars. -- Credit card information is required to hold a reservation at County Buzzz, and as a security deposit for any damages. -- 30% Deposit will be charged at reservation time. -- Balance for reservation will be charged at check in time. -- Additional fees will be charged at check out time. -- No Show: Payment for all nights booked (plus applicable taxes) will be charged if you do “not show”. -- Promotional codes can be used at reservation time, if applicable. -- Check in time: 3:00 pm to 6:00 pm. Late checkin from 6:00 pm until 11:00 pm is by appointment only. Please note, we do NOT have a 24 hour front desk. If you do not want to arrive into an empty house – do not forget to let us know the time you are planning to check in. If your arrival times changes please call/text at 647-233-5123. -- Early Check In between 11:30-2:30 pm may be available at an additional charge of $15/hour. Check in before 11:30 am requires a full daily rate as we will not be able to rent that suite for the night before. Please inquire for availability. -- Identification: ID (passport, Drivers’ Licence or other government issued photo ID) is required at check in time. -- Breakfast is served daily in our dining room between 8:00 a.m. and 9:00 a.m. If you require breakfast earlier, please provide us with 24 hours notice. Additional guests will be charged $25 for breakfast. If you have any food allergies or dietary restrictions please let us know as part of your reservation. -- Smoking: County Buzzz is a smoke free environment indoors. If your suite smells like smoke, your credit card will be charged $500 for extra deep cleaning. Smoking is permitted on the outdoor patio seating areas. -- No open flames (no candles please). -- Noise: Please be respectful of others during your stay, and avoid making noise after 11 pm. -- Parking: Parking for one vehicle per room is included. Fees apply for any additional vehicles, based on availability. -- Cleaning charges: Additional cleaning charges may apply, for smoking, pets or other unusual cleaning requirements or damage to the suites. -- Replacement cost for towels and linens stained with oils, creams, make up, wine, etc. will be added to your bill. -- Shoe removal: Please remove outside shoes when entering the house. It is recommended that you bring a pair of indoor shoes. -- Visitors: Visitors are welcome, however no overnight visitors will be permitted without additional fees and subject to maximum occupancy rules. All events (parties, etc.) must be pre-arranged with County Buzzz. -- Check out time is 11:00 am. Late checkout may be available, please inquire, and additional fees may apply. -- Late Check Out between 11-2:30 pm may be available at an additional charge of $15/hour. Late check out after 2:30 pm requires a full daily rate as we will not be able to rent that suite for that night. Please inquire for availability. -- Shorten Stay: The shortening of your stay is subject to the same rules as cancellations. -- Luggage can be stored for the day at no cost. -- County Buzzz is pleased to work with you to organize your wedding or special event. Please call us at 647-233-5123. County Buzzz will not collect any confidential or sensitive information from our visitors without their knowledge and consent, and such information will be limited to that which is needed to properly service and support our customers and prospective customer wishes. Any information about our visitors which is collected will be used only as necessary to service and support visitor requests and, unless required by law, will not be released to any third party for any reason. We will not sell or donate customer lists, mailing lists or any other compilation of visitor information to anyone. 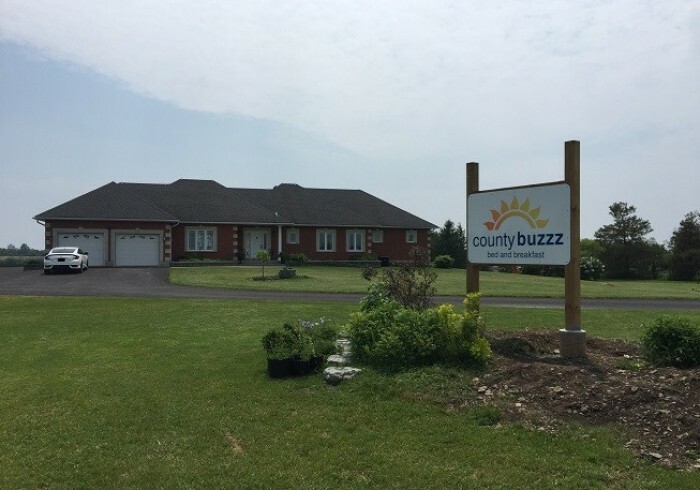 Welcome to County Buzzz Bed and Breakfast in beautiful Prince Edward County, Ontario, Canada. We are located right on the waterfront trail, just 10 minutes outside of Wellington. County Buzzz sits on 5.5 acres of land backing onto Pleasant Bay Marsh, perfect for bird watching and nature lovers. Each of our 3 luxurious newly renovated suites come with a private en-suite, king size bed and a beautiful view! We are ready for you. Relax, unwind and disconnect. Enjoy all that the County has to offer.